This is what I started to struggle with. I found I was making errors taking my tablets. I would take extra of some and not enough of others or vice versa. This caused me to get very ill when I became toxic as I was out with the therapeutic level for one of my drugs. Living with a chronic condition which is so unpredictable is so difficult. You never know whats going to happen when. You need to think about everything you do and the consequences of it. You day is often dictated for you and you need to fit your life in somewhere. With chronic illness medication plays a massive part. As the condition develops you just end up on more and more medication. Often to counter act the side effects of medication rather then the condition itself. Working as a nurse I deal with medication a lot. I know a fair bit about different drugs and what they do. I can sort out tablets and everything for my patients not a problem. But when it comes to myself I have recently been finding it so hard. Wether it is because I don’t feel well and trying to concentrate while I make sure I have taken the correct thing at the correct time and not forgotten I have taken it and not take it at all or forget and take extra. I would spend a saturday mornings sitting trying to sort through my box of pills, inhalers, liquids and nebs and sort them into a box for 2 weeks. It is not a hard job to do but I just broken down. I couldn’t cope with my medications any more I didnt want to take them, I got confused with when I was taking what. I knew I couldn’t afford to not take medication and could afford to make errors. Feeling almost ashamed I called my GP and spoke to her about my problem. She was super and arranged a dossette box for my pills which the pharmacist will make up each week for me. My pharmacist who I know well phoned to chat to me about it but was really busy and wanted to see if I could wait till february before he did it but he would give me a weeks medication in boxes instead. I almost broke down. I was on the edge of tears. I think because it was all becoming real that I have really been struggling to cope with how much I am having to take. I said it was fine and I would just go back to getting my scripts 2 monthly but that would mean phoning my GP up and getting another script sent out. For me I think I had rationalised out in my head that by having my prescription done weekly and someone else was putting my pills in separate bits for me then I would not be as aware of how much medication I am actually taking. I can swallow about 15-18 pills at once with no bother so in my head having them in all in a box with no input from myself then I just have to pop one pack and chuck them down compared with before having to pop what felt like hundreds of pills out their packets each morning (twice in the morning so I could put y lunch ones in a box for work) and night. By the pharmacist giving me a weeks supply in boxes I felt I was still bogged down by loads of medication and almost just need a break from it. A break which I can’t have as can’t go without taking it! Having the box has made a big difference. I was getting so confused by what I was taking and how much I was taking and when. Even when I had a list I would get lost and forget what I have or have not taken. This was not so bad when I was feeling well but on days when I have had little sleep or am feeling pretty bad it was such a mammoth task. This picture I posted to instagram shows what i used to have in the top two photos. 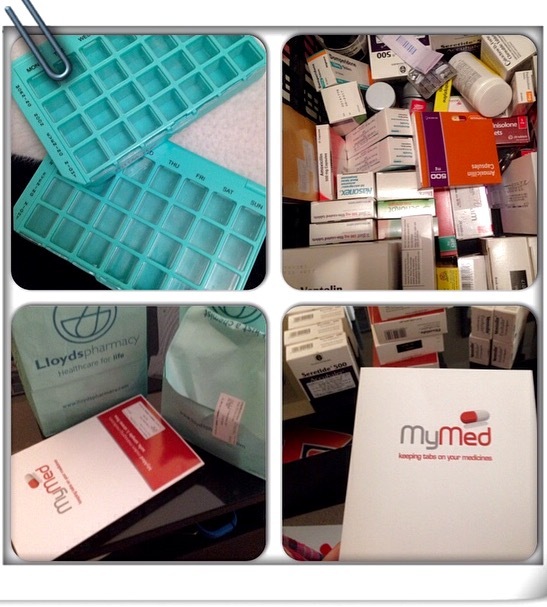 I would need to use 2 7 day pill organisers to fit everything in for a week and had a huge box of all my meds. It would come in shopping bags. Thank goodness I don’t have to pay for those bags!!! But now the bottom 2 photos I get my inhalers in one bag and nebs in another and my pills in the dosette. It has only been a week but so far I have already noticed a difference even if it is just to make life easier and psychological so I don’t think I am taking so much I don’t care. I helps. It also means I don’t feel like I am living in a pharmacy. Other than nebs and inhalers lying around to reach when needed I don’t need to see piles of pill boxes anymore. I am really thankful to my GP and pharmacist for sorting this out for me.